Raspberries not only have a sweet, tangy taste, but they are also rich in vitamins, antioxidants, and fiber. One cup (123 grams) of raspberries will provide you with 54% of your recommended daily intake of vitamin C, 41% of your recommended daily intake of manganese, 32% of your recommended daily intake of fiber, and 12% of your recommended daily intake of vitamin K.
Recent animal studies suggest that there is a positive correlation between the intake of flavonoids found in raspberries and memory improvement. 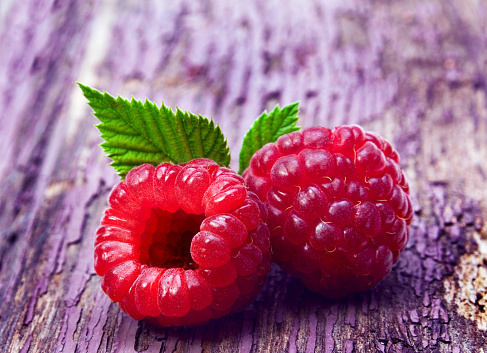 Research shows that consuming raspberries also has the potential to reduce the cognitive delay that comes with aging. The polyphenols anthocyanin, flavonols, and ellagitannins found in raspberries help reduce oxidative damage caused by free radicals and help prevent or reduce the risk of heart disease. According to a study published in the American Journal of Clinical Nutrition, there is an association between consuming flavonoid-rich foods, such as raspberries, with the reduced risk of death from cardiovascular disease. In particular, anthocyanins have been known to reduce inflammation that leads to cardiovascular disease. The polyphenols found in raspberries can also help reduce the risk of cardiovascular disease by reducing blood pressure. In another study conducted by Norwich Medical School and Harvard Public School of Health, researchers tracked 93,600 women between the ages of 25 to 42. The study concluded that a regular intake of anthocyanins, from berries, reduced the risk of heart attacks by an astonishing 32% in young and middle-aged women. Another study shows that the potassium found in berries can help the heart as well. The study analyzed participants who consumed 4,069 milligrams of potassium per day—it lowered their risk of death from ischemic heart disease by 49%. Raspberries have a high concentration of ellagic acid—a phenolic compound that can prevent, or slow down cancer (i.e. esophageal, lung, mouth, pharynx, endometrial, pancreatic, prostate, and colon cancer) by stopping the growth of cancer cells and destroying the progress of other existing cancer cells. Raspberries contain high amounts of fiber; consuming fiber can help keep the blood sugar levels stable. Several studies have shown that type 1 diabetics who consume high amounts of fiber have lower blood glucose levels. Type 2 diabetics could see improvement in their blood sugar, lipids, and insulin levels. Those who suffer from constipation and consume raspberries require fiber and water to flush out the system. Recent studies suggest that high fiber diets could play a role in regulating the immune system and inflammation, which decreases the risk of cardiovascular disease, diabetes, cancer, and obesity. Raspberries are a good source of vitamin C; research shows that a diet rich in vitamin C can help reduce UV-related DNA damage. Furthermore, eating three or more servings of fruit a day can decrease your risk of developing age-related macular degeneration. A phytonutrient in raspberries called rheosmin, also known as a raspberry ketone, has the ability to increase oxygen consumption and enzyme activity for certain fat cells. Metabolism is put into hyper speed, which can decrease the risk of obesity and fatty liver disease. Raspberry ketones also decrease the activity of a fat digesting enzyme that is released by the pancreas. Although raspberries are available year round, it is best to pick them from June to October. If you are purchasing them from the store, select the ones that are shiny and deep red with an attached green cap found at the top end. Avoid the ones that are dull, sunken, or splattered with spots of mold. Raspberries will perish early, which means you should purchase them shortly before you plan to use them. Always sort them before you store them; separate the bruised and moldy ones and throw them out so they don’t spoil the others. Place them in a refrigerator if you plan on eating them within a few days, or store them in the freezer if you plan on consuming them in a week or so. Add raspberries, grapes, and walnuts to your salad. Top whole grain waffles or pancakes with fresh raspberries. Add raspberries to homemade muffins and sweet breads. Keep a bag of frozen raspberries on hand and add them to your smoothie or oatmeal. “Raspberry nutrition facts,” Nutrition-and-you.com; http://www.nutrition-and-you.com/raspberry.html, last accessed July 22, 2015. Ware, M., “What are the health benefits of raspberries?” Medical News Today web site, October 3, 2014; http://www.medicalnewstoday.com/articles/283018.php#nutritional_breakdown_of_raspberries. Logosh, S. “Why You Should be Eating More Blueberries and Raspberries,” One Green Planet web site, August 14, 2013; http://www.onegreenplanet.org/natural-health/why-you-should-be-eating-more-blueberries-and-raspberries/. “Health Benefits of Raspberries,” Organic Facts web site, https://www.organicfacts.net/health-benefits/fruit/health-benefits-of-raspberry.html, last accessed July 22, 2015.